From adventure routes to sport crags, the Green Mountain State has a lot to offer. Hayden Bove on The Doggfather (5.12b), 82 Crag, Bolton. 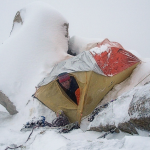 Photo: Outdoor Gear Exchange. 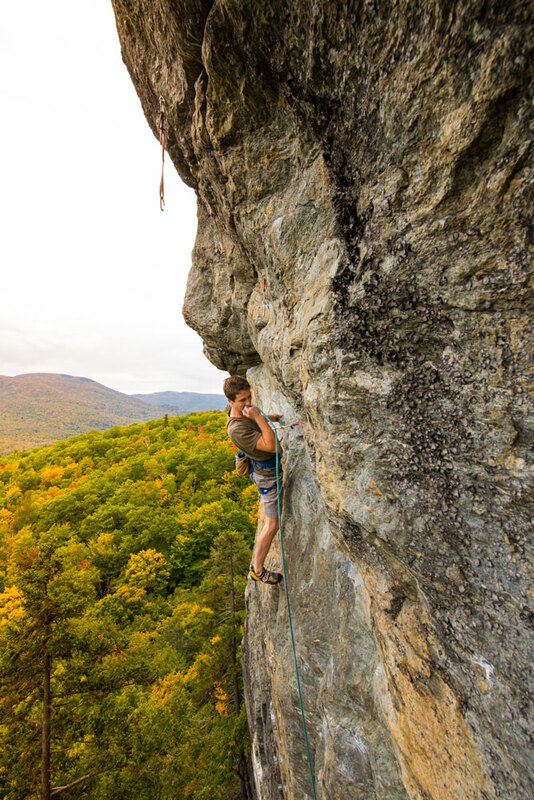 Falling in the shadow of the Northeast’s more prominent climbing destinations, Vermont’s rock has remained relatively unknown. Yet tucked into the rolling Green Mountains, Vermont’s climbing maintains the solitary sense of adventure that so often gets diminished amid the crowds of Whitehorse, Rumney, and Acadia. From the long routes of Wheeler Mountain and Marshfield Ledge to the sport crags of Bolton to the boulders of Groton and Smugglers’ Notch, this little state has a lot to offer. 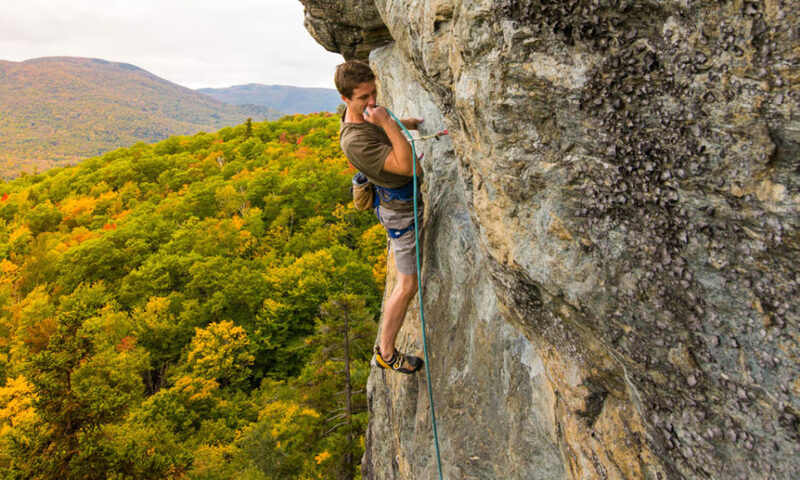 Here are the highlights and beta for Vermont’s top climbing destinations. 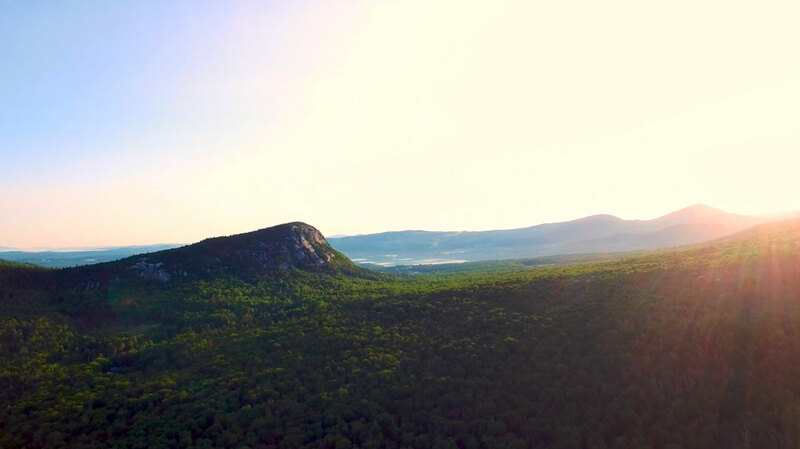 View of Wheeler Mountain from above. Photo: Sam Davies / Outdoor Gear Exchange. 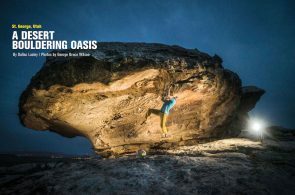 Up in Vermont’s Northeast Kingdom near Barton and east of Lake Willoughby, the adventure of climbing’s early pioneering days is still alive and well. 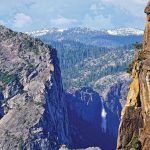 This crag’s first documented route was climbed in 1947 when James C. Maxwell and John C. Hurd scrambled up Wheeler Mountain’s Standard Route. The steep granite slabs and cracks were established with a traditional ground up ethic—expect the climbing to be both exciting and bold. Wheeler Mountain is rarely crowded, and with 100-plus routes to find and project, you should plan on having to do a little cleaning while you’re there. Hit up Kingdom Trails for mountain biking and trail running, or swim and paddle in Lake Willoughby. Sam Baum on Just for Goobs (5.7), Marshfield Ledge. Photo: Sam Davies / Outdoor Gear Exchange. Perhaps it’s the lack of cell phone service, the length of the approach, or the bumpy logging roads that protect this crag, but Marshfield Ledge might be Vermont’s best-kept secret. Remote in the best way possible, Marshfield has no crowds, no roads in sight, and no noise: just granite slabs and the High Grade Ledge, which features some of Vermont’s hardest sport climbs, including a few of the state’s only 5.14’s. Hidden in nearby Groton State forest, there are 100-plus established boulder problems. If you stay at Kettle Pond, the Gem Boulder—also known as the Campground boulder—is right by some of the lean-tos and offers a dozen problems of varying difficulty. Check in with locals for beta as most of these boulders are found through word of mouth. Fall, with its brilliant foliage and cool temperatures, is the best time to climb at the cliff, hands down. Part of the cliff is closed due to nesting Peregrine Falcons during the summer. Spring can yield decent days because the ledge is south facing. David Russo on the classic V2 Gem Boulder, Groton State Forest. Photo: Josh Worley / Outdoor Gear Exchange. Hike the Owl’s Head Trail in Groton State Forest for a lovely view of Lake Groton. You can also paddle at any one of the state forest’s many pristine ponds. Roy Quanstrom on Touching the Sky (V12), Smugglers’ Notch. Photo: Sam Davies / Outdoor Gear Exchange. 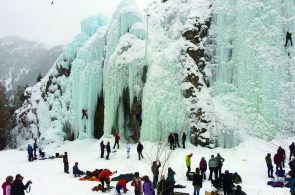 Smugglers’ Notch, also popular to skiers and ice climbers, is Vermont’s “alpine” training ground. 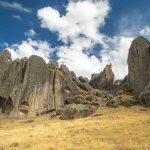 The Notch, as it is lovingly referred to, is also full of roadside boulders that have fallen from the jagged cliffs lining either side of the road. These boulders have caught the eye of climbers and tourists alike ever since the winding mountain road has been open to automobile traffic. John Sherman’s famous book “Stone Crusade” even gives mention to the bouldering potential in The Notch. 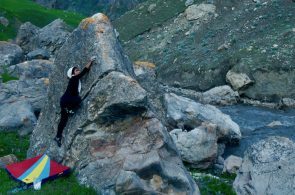 More recently, climbers have started to explore the area’s longer walls and new route potential. 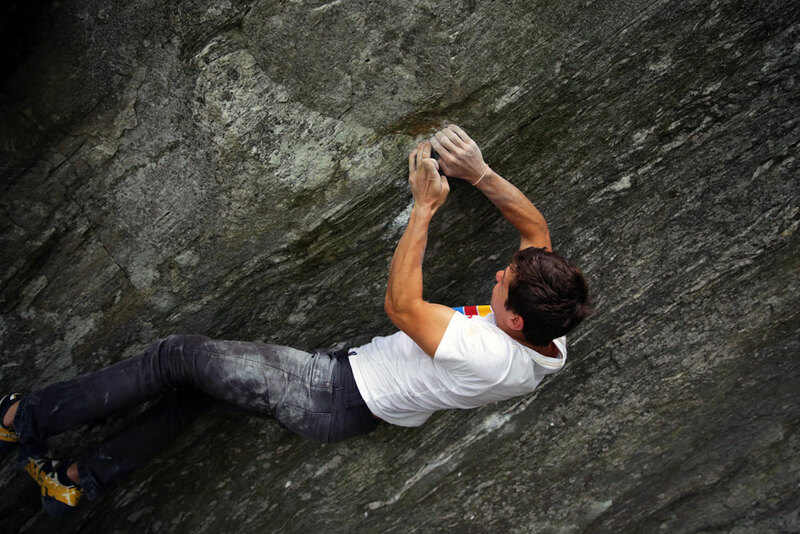 Check out the digital version of Travis Peckham’s Tough Schist: Rock Climbing in Northern Vermont for updates and new routes (found on the Rakkup App). May through October. Smugglers’ Notch is one of the only places in Vermont to climb during the summer months, when the heat and bugs are unbearable elsewhere. You can also bring a headlamp and climb at night to escape the warmer temperatures. Hike Mount Hunger or paddle/swim at Waterbury Reservoir. Then check out some live music and drinks at the Rusty Nail in Stowe. Lots of Air BNB options and ski homes are available to rent at off-season summer rates. The Ben and Jerry’s factory for dessert! 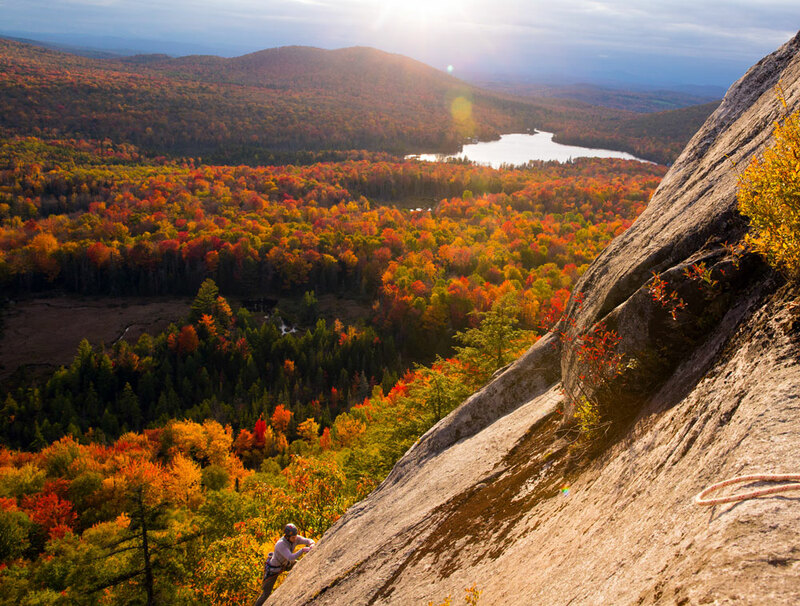 Bolton is 30 minutes from Burlington and has become the go-to destination for the after-work climbing crowd and weekend warriors. 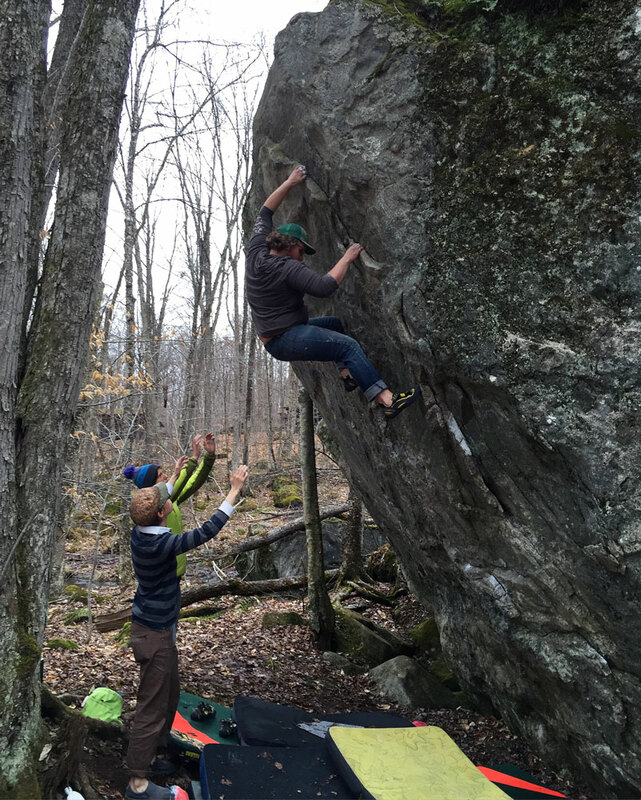 The crags of Bolton are not just convenient, they are also diverse and one of the few places in Vermont with casual “craggin”. 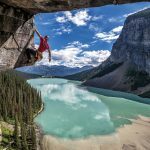 Climbers can expect to find something for everyone here, whether they’re looking for trad, sport, multipitch, or top rope climbing options. There are also some boulders at the base of Upper West Bolton, though boulderers would be better served making the drive to Smugglers’ Notch or Groton. September and October are fantastic in Bolton. May through July can yield good days, but it will be buggy. Many of the cliffs in Bolton are closed in the spring for Peregrine Falcons. Check with Crag VT for info on closures. Check out nearby Burlington! North Beach and Oakledge Park offer great barbeque spots, beach lounging, and slacklining opportunities. Head downtown and do some shopping on Church Street—there is a little shop there called Outdoor Gear Exchange where you can get all the climbing gear and beta spray you desire (wink-wink). And while you’re in town, stop by some of the breweries in Burlington’s South End. Plenty of AirBNB and rental options are available in and around Burlington. Dave Russo is a staff writer for Outdoor Gear Exchange. 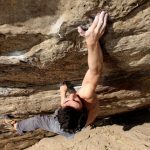 Based in Vermont, he is a short drive from adventures at one of many local Green Mountain crags. When he isn’t out exploring new cliffs and boulders, he can be found curled up with a book, joined by his partner Helen and their crag dog, Willow.